In Sydney Chinatown there’s a fabulous little Chinese BBQ joint called Mr Wongs. When I was still working in Sydney, I often used to drop by on my way home and pick up some BBQ treats to use as the base of a quick and satisfying dinner. The duck was always a favourite but I also loved the BBQ pork. Since moving to the mountains, I’ve been missing my Chinese BBQ treats. 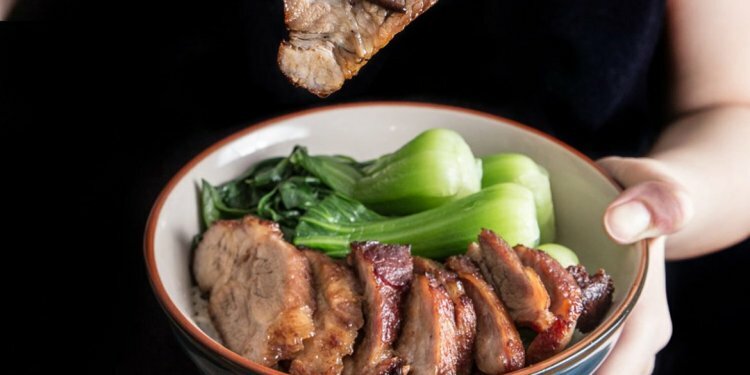 So when I spied a recipe for char siu, my beloved BBQ pork in this month’s Gourmet Traveller, I dared to hope it would be possible to replicate Mr Wong’s deliciousness at home. The great news is I did! Adapted from Lisa Featherby’s recipe in Australian Gourmet Traveller. Brilliant served with steamed or BBQed Asian greens such as bok choy or choi sum. 1. Slice pork into pieces about 2cm (1in) thick. 2. Combine hoisin, honey, soy and 5 spice in a glass bowl. Toss pork in the marinade. Cover and refrigerate for at least 2 hours or up to 2 days. (I marinated for about 4 hours on my first attempt). Remove pork from the fridge an hour before you’re ready to cook. 3. Preheat a BBQ on a medium high heat or your oven to about 150C (300F). Place pork on a rack with a tray underneath to catch the juices. BBQ with the lid down or roast for 30-45 minutes, turning once or twice or until the pork is cooked through. 4. Meanwhile, bring the marinade to a boil in a saucepan to kill any bugs and concentrate it a little. Allow to cool.